The upcoming bird sanctuary at Thinungei village is reportedly Manipur’s first. Of the thousands of migratory birds that have landed this winter at Loktak Lake, in Manipur in northeast India, the rare sighting of a once-abundant songbird with distinctive bright yellow underparts holds a different meaning for birders. 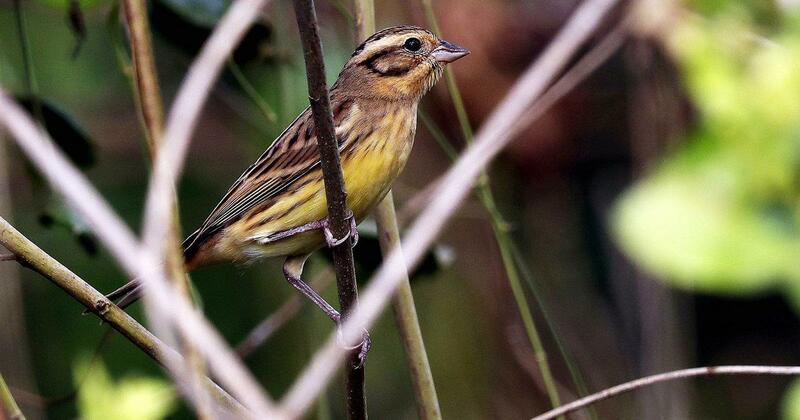 The critically endangered yellow-breasted bunting, which has been driven to the edge of extinction mostly due to illegal hunting on its migratory passage sites such as China, was spotted in Manipur in 2017 and now again in 2018 – decades after its recorded sighting in the state during the British colonial period. The bird was sighted in Thongjaorok river at the mouth of the Loktak Lake in the first week of November 2017 and this time at the proposed area of Thinungei Bird Sanctuary, said Birjit, who spearheaded the conceptualisation of the bird sanctuary. The sighting of the bird has given a fillip to the conception behind the upcoming bird sanctuary, Manipur’s first. 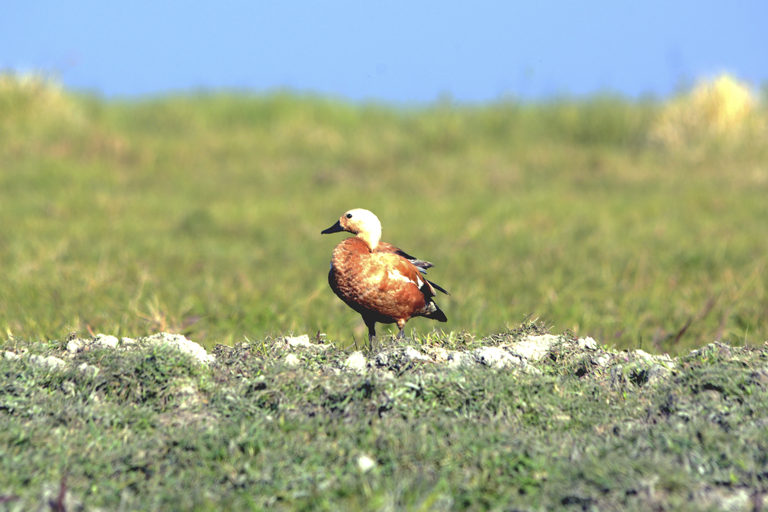 Ruddy shelduck in the proposed area of Thinungei Bird Sanctuary. Ducks and geese are the most prominent visitors in this region. Photo credit: RK Birjit. With a push from conservationists and strong participation of local community, especially youth, the state government aims to ramp up the number of dwindling birds around the shrinking Loktak Lake by setting up this sanctuary in a one square kilometre wetland patch in Thinungei village to the west of Loktak Lake. An Important Bird Area and globally recognised wetland, the Loktak lake and associated swamplands supplied by several streams cradled in the Irrawaddy basin, is home to a rich array of waterbirds such as the lesser whistling duck, a resident and locally breeding species often photographed as they whistle away in unison while taking flight. Further, the state’s location on the Asian migratory flyway of birds means the grasslands and mudflats of the lake double up as landing pads for a rich assemblage of migratory waterbirds such as ducks, geese, darters and cormorants, gulls and terns, grebes, storks, plovers, lapwings, snipes and sandpipers, in the winter. Come October, these feathered guests arrive from China, Mongolia and Siberia to escape the harsh winters, feed and rest. Ducks (including the lesser whistling duck) and geese, the most prominent visitors, can be seen dabbling and diving for food in the verdant floodplain wetland habitat in Loktak. In total, the state has a recorded avifauna of 638 species. However, Loktak’s wetland cluster has witnessed a sharp fall in numbers of the annual winged visitors as also resident species. The Loktak Waterbird Census 2018 tracked a total 15,841 birds belonging to 46 different species at 50 selected sites against last year’s count record of 17,333. According to the 2014 book “Water Birds of Loktak Lake”, the waterbody supported 57 waterfowl species that have dwindled to 21 in recent times – a 63% decrease. “From 40,000 to 50,000 waterbirds in 2016, including the migratory birds, the numbers have come down to 17,000 this year in Loktak lake. The number of species observed has also dipped from 68 to 17,” pointed out Birjit. A spurt in use of LED lights by fishermen in the last two to three years has been blamed for disrupting the nesting patterns, breeding period and foraging behaviours of the waterbirds of Loktak. “Migratory birds depend on cues from properly timed seasonal schedules. Artificial lights can also cause them to migrate too early or too late and miss ideal climate conditions for roosting, foraging and other behaviours,” he said. LED lights are a recent addition. N Sony, member of the Manipur chapter of Indian Birds Conservation Network, also attributed the decline to increase in water level of the wetlands in the aftermath of the commissioning of the Ithai barrage. “The migratory birds in Manipur mostly belong to the duck family and they like shallow water but due to the Ithai barrage the water level is always rising. These could be the reasons why migratory birds are avoiding the area,” Sony said. The sanctuary site at Thinungei is a mushroom shape jutting out from the village into the lake, against the backdrop of rolling foliage-draped hills. It is rather enticing to waterbirds because of the floating biomass (locally called “phumdi”), mudflats, grasslands teeming with ample fish and insects. One third of this bird sanctuary site is swampy, followed by a zone of phumdi and then clear water. The diversity of birds here and the enthusiasm of youth prompted the conservationists to take up the cause of declaring the stretch as a bird sanctuary. “More and more young birders are coming up. The pivot behind the bird sanctuary are the inhabitants of Thinungei,” said Sony. 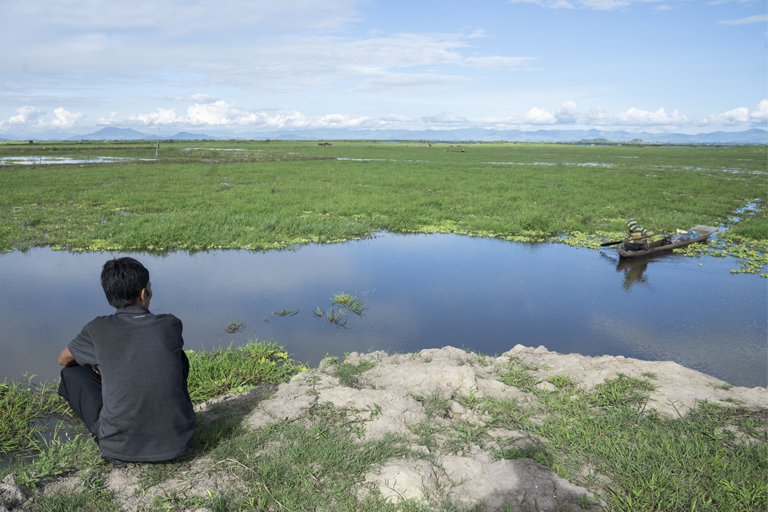 To Bankim Chandra, a Thinungei resident, the arrival of birds signal the health of the lake. “The birds indicate if the water is pure or bad. We are making an effort to set up this sanctuary for our future generations. Initially some villagers who fish in the particular stretch had expressed hesitation but they have gradually come to see reason,” Bankim Chandra of the local community organisation Pole Star Guardian, told Mongabay-India. One third of this bird sanctuary site is swampy, followed by a zone of phumdi and then clear water. Map by RK Birjit. 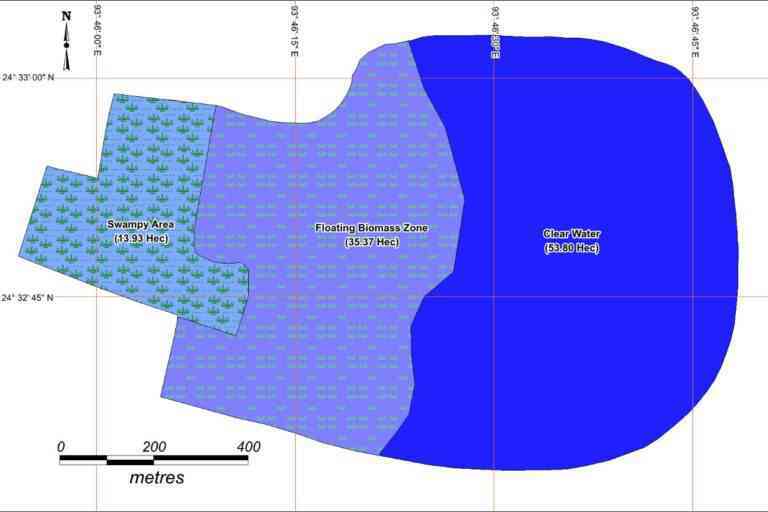 Since this site also overlaps the villagers’ fishing spot, tourism and conservation education is envisaged for them. “For the last five years we have been convincing the local community members to conserve the periphery of the sanctuary. There will be a big component for the fishing community in the project. We have to see how we can ensure a changed landscape of economy around the sanctuary. We are surveying what are the hurdles in changing their livelihood from fishing,” Birjit said. The revival of avifauna in the lake is also linked to its global recognition. If it consistently supports a certain percentage of individuals in a population of one species or subspecies of waterbird, the sanctuary will also help Loktak Lake to cling on to the tag of a Ramsar Wetland of International Importance, assert Birjit and colleagues. The Loktak Lake was designated a Ramsar Site on 23rd March 1990. Soon after its recognition as a wetland of international importance, the Loktak was listed in the Montreux Record, “a record of Ramsar sites where changes in ecological character have occurred, are occurring or are likely to occur.” The Loktak lake is still in the Montreux Record. Conservationists and local community members are helping set up the bird sanctuary. Photo credit: Kartik Chandramouli/Mongabay.